Iceninja is a Super Smash Bros. Ultimate (formerly SSB4) player from Ontario, Canada who mains Palutena. 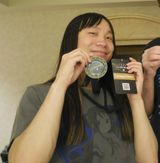 Iceninja is considered to be one of her best players in the world, as well as one of the most successful female players and transgender players in the SSB4 and Ultimate scenes. She is currently ranked 8th on the Ontario Smash 4 Power Rankings. 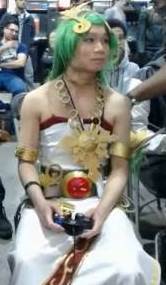 Iceninja cosplaying as Palutena at Enthusiast Gaming Live Expo. Since Canada Cup 2015, Iceninja has regularly cosplayed to major events for Smash and other fighting games, including as two of her frequently-played Smash 4 characters (Palutena and female Corrin). This page was last edited on January 31, 2019, at 17:25.